Groups gathering in Granbury can expect much more than the perfect venue. From the lush vineyards and wineries to a famous craft brewery or live entertainment on the Historic Granbury Square, your group might gain just as much from their offsite experiences as the planned event! One of the things that sets Granbury apart when looking for the ideal venue is the array of experiences we offer. In Granbury, you’ll find exceptional event locations and exciting off-site experiences, perfect for your wedding party or meeting group. There are lodging options from full-service hotels to distinctive and elegant bed & breakfasts. During the warmer months, your guests are sure to enjoy the sandy City Beach and Lake Granbury just blocks from the Historic Granbury Square. Additionally, see our list of restaurants to complete your catering needs. 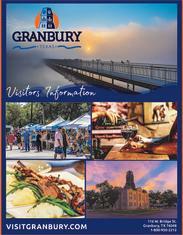 No matter what you choose for your venue and activities, when you choose Granbury, you are guaranteeing a memorable experience for all who attend.